What’s Happening at my Sewing Machine | What Would Hazel Do? My current project is a pair of trousers for work wear. I’m using a poly-viscose called Navy’s Navy that I bought from Tessuti in Melbourne. 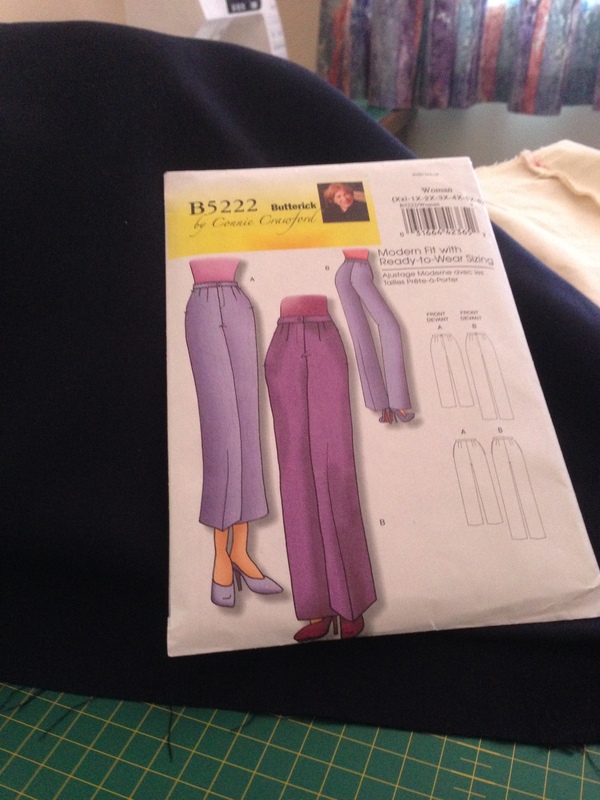 The pattern I’m using is Butterick B5222 from the Connie Crawford range, which has been described as a well-fitted pants for all sizes and shapes. I’ve completed a test run in calico so am now testing it for the first time on fabric I want to wear. Have now completed and with a few adjustments it has come out fairly well. I like the fit around my hips and bottom and across my tummy; always a challenge for me. I adjusted the back seam and next time I’ll lower the top of the back; it sits a bit high. I’ll also make a length adjustment next time – missed it this time and had to cut off about 8cm and then fiddled to get the hem to sit right. But given that pants with side pockets don’t always sit well on me I’m very happy with these. I would have liked to have seen more guidance with tummy adjustments considering the pattern is aimed at being able to adjust for full-figured proportions.